The Lumberjack’s Double Knuckle Challenge (Now New and Improved!) It's Bigger and Badder than ever before.. The Double Knuckle Challenge is so hard that only 2 men have managed to complete this challenge in the agreed 45mins so far! This is for all those out there who genuinely love Pork Knuckles and have the appetite of a Bavarian lumberjack, Octoberfest slow roast 2 of our 1kg Pork Knuckles and serve them on a bed of chips and a side of Sauerkraut served with 1 litre of Imported Bavarian Lager which must all be eaten and drunk within 45mins. If you complete it we give you the stein glass to keep as your trophy!! DAS BOOT CHALLENGE - The Octoberfest Pub cultivated the time honoured tradition of German glass boot drinking (The German version of a yard of ale). The challenge involves 1 litre of Imported Bavarian Lager which needs to be ingested from the boot as quickly as humanly possible! They have a wall of fame which you have to get under 10.1 seconds to get on and the record is an astounding 5.6 sec! The cost is £10 to try and glory awaits for those with the fastest time! It is on the menu at the Hungry Horse Cafe in Corby, Northants, for £12 but is free to anyone who manages to scoff the lot. 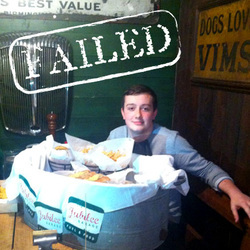 One wall is full of photos of 60 customers who have tried – and failed. On the Plate.. you get three sausages, three fried eggs, three potato waffles, three potato scones, three burgers, three portions of beans, three rashers of bacon, three hash browns, three slices of black pudding, three portions of mushrooms, three square sausages, three slices of fried bread, three rounds of bread and butter, three pieces of toast. THE Big One weighs 6.6lbs and boasts 7,500 calories. To burn it off, you would need to cycle for 10½ hours or clean the house for 21 hours. Possibly Britain's biggest burger has been created, The Beast, weighing in at a combined total of 15 lbs, including a pound of chips, is the brainchild of chefs at Burgers at Blacks who are confident their monstrosity will stop even the hungriest of customers in their tracks. Vas Herodotou, who owns the Brighton Road restaurant, said: "I’ve done my research, scoured the internet and "There is a place over in Norwich (Over De Flames has now sadly closed) held the title with 3kg of meat, but ours is a smidgeon over that. "We spoke to some of our customers and we already have a huge list of people who want to give it a go, "You know what us lads are like, we can’t resist a challenge, but I don’t think there is anyone out there who can finish it." Such is the weight of the meat, Mr Herodotou had to especially commission Croydon Bakery, on Mitcham Road to make the 30cm diameter bap, experimenting with thicker flour to hold "The Beast". 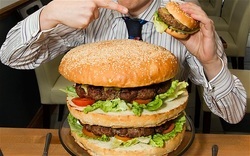 To take on The Beast, customers must order 24 hours in advance and have one hour to try and complete the 17,000 calorie monster and win a place in the restaurant’s hall of fame. The £10.99 specaility Breakfast created by the owner Mario in Westhoughton is truely what you need to get you started on your day, Eat it all within 20 mins (without a drink) and you get it free! The Big Breakfast consists of 10 eggs, 10 bacon, 10 sausage, 10 toast, 5 black puddings, tomatoes, beans and mushrooms. If you finish the burrito and nachos within the 30 minutes you have won the ‘Sink the Titanic’ challenge…(NB this will not happen)… your photo goes on the wall, you get a meal voucher, a certificate, a T-Shirt and you don’t have to pay for the Titanic…tempting isn’t it?! So do you think you could ‘Sink the Titanic‘? Are you brave / daft / drunk enough to take on this bad boy? Have you the ice-cold determination, grit and sheer chutzpah to step forward and declare that in the eternal battle of Man Vs Food “Man Wins”? A Giant 5lb Burger challenge made up of delicious prime steak burger, touch of lettuce and tomato, topped with a lotta smokey bacon and cheese, smothered in their own sticky and sweet BBQ sauce, allstuffed into a ten inch 10ozseeded burger bun, served with a side of fries ans 'slaw! Fat Boys Cafe - The Breakfast Blowout! The Blowout is the brainchild of Farouk Hassanein, owner of the Fat Boys cafe in Thornton Heath. It containins a packet of bacon, two jumbo sausages, two eggs, tins of beans, mushrooms and tomatoes and a fried slice. This gut-busting breakfast draws in roughly 100 customers a week trying to brave the mountain of food that is cooked for them but according to Mr Hassanein very little succeed but if you are able to you don't pay the bill. The 42-year-old trained accountant started the business 12 years ago and has now expanded to other areas around London and other lines of work. See if you have the appetite for a 72 oz Rump Steak (cooked to your preference), House Salad and Chips. 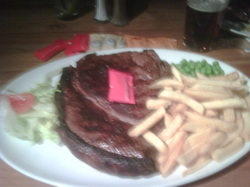 If you finish it in under an hour then the steak is free however fail and it will cost you £49.95. Hoggit & Hoof is an independent gastro restaurant in Newbury Market Place. They are a steakhouse offering a superb range of steaks alongside great shellfish and vegetarian food. Run and owned by three local business men, Hoggit & Hoof combines the best of regional food with reasonable prices and exemplary, individual service. With carefully chosen wines and beers to compliment our fresh, home cooking we believe that Hoggit and Hoof brings a real alternative eating experience to Newbury. 17 Market Place, Newbury, Berkshire, RG14 5AA. 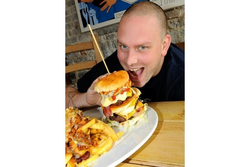 Seven people have attempted “The Beast” from Warrens Gourmet Burger Company in St Annes Bristol and so far… all have failed. The Owner, Tom explains that "The challenge sounds easy enough at first: eat your burger (with chips and coleslaw) in under an hour and you’ll get your meal for free", have your picture put up on their wall of fame plus get a free t-shirt. It starts to sound a little more difficult that The Beast is so-called for a reason…it’s a massive 4.5lb burger which has defeated everyone that’s taken part so far. The challenge is open 7 days a week, from 12pm to 9pm – so if you think you can beat those who have previously failed, head over and give it a go! And if you fail? No penalty, just the £15 cost of your meal. Annes Park, Bristol, Avon, BS4 4AL. One thing i hate when eating out it not being able to customise my own meal... I hate going to eat somewhere and not being able to replace an item the comes with my preferred choice for another item of equal value... y'know - "can i get onions instead of mushrooms", "can i get more cheese but no tomato?" - and having someone charge me for the extra cheese or onion - when i'm not taking the tomato/mushroom/salad included just reeks of poor customer service & cheapness, and i'm the guy that wants it his way. Along with with ripping up the rule book you'll also find the biggest known burger in Ireland. If you want a burger, accept no substitute - BUILD A BURGER RULES! This place was one of my favs places to visit, home of the informous 26" Pizza. Nestled within Bloomsbury Bowling Lanes, Rays Pizza is an amazing place; You'd be forgiven to think that a 26" Pizza is too much but it really is something else, the pizza has a wafer thin-crisp crust that's soft around the edges and not too wet in the middle, bits of fresh basil and a lacing of extra-virgin olive oil through the sweet tomato sauce, after the pizza comes out of there conspicuously non-wood-burning (ie. Not Trendy) oven, it gets a ceremonial dusting of real Parmesan, administered in slow, deliberate, old-world style. you'd alsso be amazed to here that they also do a pdeele powered delivery service for gratis! Our pizzas come in 3 different sizes, 12inch, 18inch and 26 inch. Big Ernie's Diner goes down the 1950s nostalgic route when hamburgers, milkshakes, Formica and Elvis ruled and where bobbysockers, those white-socked high school kids, would hang out. World Famous Hollywood Desserts go down the same Real American route: Humphrey Bogart is a banana split, Fats Domino a chocolate and vanilla brownie sundae. One thing is for sure: Momma's Apple Pie wasn't made by a real momma or a person but a machine. the callenge is to eat all the.. in 45 mins, your prize is the chnage you walked in with and your name on the wall of fame! 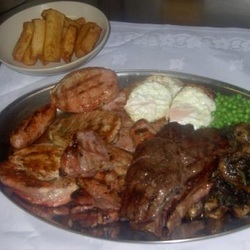 This really is a sight to behold a monsterous 69oz Challenge Mixed Grill ! 1 x 2oz Steak, 2 x 12oz Gammon, 3 x 8oz Lamb Chop, 2 x 10oz Pork Chop, 1/2 Chicken, 4 Sausage, 2 Eggs, Mushrooms, Peas, Side Salad, and a Bowl of Chips and all your for £29.95. Not satisfied with one challenge the Sizzle and Grill also have the Quadruple Bypass Burger 4 1/2 pound steak burgers, layers of cheese, bacon, onion rings, lettuce leafs,Beef tomatoes, mayonnaise, warm ciabatta bun, mushrooms, side salad and chips but this one is for honour only.. Custom House in Barnstaple, Devon are running a Totem Burger Challenge!! Complete the "Totem Burger Challenge" and walk away with a T-Shirt and your picture on the wall of fame!! Whats more, finish in mess than 30 miutes, and its FREE!!! 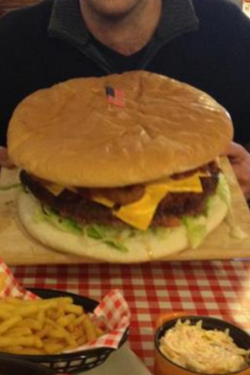 The challenge consists of a 2.5lb stacked burger and 4lb portion of chili cheese fries! its just a shame the Hell Burger isnt still on their menu... heres hoping for the future. Dry-aged, USDA Prime (the highest category from the United States Department of Agriculture), corn-fed steaks with a selection of cheesy, creamy sauces; fat burgers; onion rings; bacon-wrapped meatloaf. There’s one little number called The Tomahawk, 32oz of Aberdeen Angus; and sides include ‘giant potato stuffed with three cheeses, sour cream and bacon’. Unfasten those whalebone corsets, laydeez. this one purely for the glory, no T-shirts or free meals here, just fine dining for the hungy office types.. The Super Scooby is loaded with four 1/4lb beef patties, eight rashers of bacon, eight slices of cheese, 12 onion rings, lots of salad, and three sauces. It also comes with a side portion of chips. The burger is six inches tall, has a circumference of 13 inches, and weighs 1.5kg - the same as a family-sized roast chicken. The Jolly Fryer takeaway in Filton, Bristol, is selling the meal for £10 - and will give anyone who can finish it in one sitting a free can of diet coke. 557A Filton Avenue, Horfield, Bristol, Avon BS7 0QH. HUNGRY diners can have their fillet... by wolfing down Scotland's biggest meal. Customers at Aberdeen's Apache Spur are taking part in a 64 OUNCE steak challenge — and they have just ONE HOUR to polish off the meat plus a side of onion rings, chips or a baked potato. If they can scoff four 16oz steaks, they'll get the £59.99 meal for free. 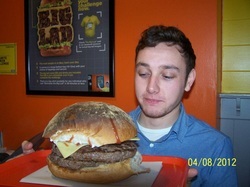 Since the challenge was launched in October 2009, 20 meat-lovers have attempted it but only TWO have finished the grub. The 84oz Burger stack - thats right! burger upon burger upon burger stacked high and ready to destruction..
On a separate note, it’s also very refreshing to see a restaurant cooking up real chips and not the usual freezer chips rubbish. For a quiet drink in a friendly bar, or for that special meal or occasion, Macmillan's Bar, Worthing, West Sussex is the place to visit. Serving speciality steaks and excellent food, Sunday Lunch and Every Evening, there is something for everyone. There customers have told them that this is the place to come for "The Best Steaks in Sussex" and "The Big Steak"..
3 Union Place, Worthing, West Sussex, BN11 1LG. Beef carefully selected from continental cross herds of 30 months & under. the Hungry fox take great pride in guaranteeing that there Yorkshire Beef is matured for 35 days making it the the best tasting possible. THE 40OZ STEAK CHALLENGE...ARE YOU MAN ENOUGH Try there hooks challenge...a massive 40oz rump steak with all the trimmings, £29.99. Hooks is situated between Bohemia nightclub and AMF Bowling on Torwood Street. If you clear the plate you get it for free!!!! The challenge is timed, so can you make it to the top of the leader board? What is believed to be Burton's biggest breakfast butty has been made by two women in a town centre sandwich bar. Debbie Robinson, 40, from Stapenhill, who owns Rumbletums in New Street, had her biggest and most unusual order yet when a customer walked in and ordered a 'gigantic breakfast sarnie'. The man, ordered a huge sandwich which consisted of a staggering eight slices of bacon, four sausages, three eggs, four portions of mushrooms, half a pound of cheese and a whole can of baked beans on a huge unsliced white loaf. To start the sandwich, Debbie and a colleague cut the loaf into three sections horizontally and placed the cheese on the bottom two halves before putting it into the oven. Then the eight slices of bacon and four sausages were cooked on the griddle along with the mushrooms and three eggs, while the beans were cooked in the microwave. The mammoth butty took 15 to 20 minutes to cook and was taken out of the oven to put it together. On the bottom half, four slices of bacon, two sausages, and a handful of mushrooms were stuck to the cheese, The second layer had the other four slices of bacon, two sausages, two eggs and the rest of the mushrooms then place together with the top of the loaf wedged on top. Debbie said: "When the man walked in and ordered that we started laughing - we thought he was joking. We kept asking him if he was serious and his daughter replied 'honestly, my dad has them all the time and cooks them himself at home'. "I've never made anything so big before and the man had to tell me which way he liked the bread cutting and specified what he wanted and where. "The size of that would have easily fed a family - I don't know how anyone could possibly eat a sandwich that size." Rumbletums colleague Jenny Seth, 61, from Henhurst, who helped make the beast, said: "In my 15 years of catering, I've never seen a sandwich that big. "We thought he was joking - but obviously not. It looked like two bricks from a house." Called the "Kids breakfast" because it weighs the same as a small child at around 10 pounds (more than most new borns by the way) !! It costs 15 quid and If you eat it within 60 minutes you get it for free.....no one has ever finished it!! Whether you are popping in for a take away cappuccino and a bacon roll or sampling one of our famous breakfasts, we aim to serve you the freshest homemade food possible. We offer a full take away and delivery service as well as free WIFI in our modern air-conditioned 56 seat restaurant. Or just chill out with a fresh coffee in our comfortable lounge area. As well as a large free carpark and friendly staff, at Jester's we never stand still and are constantly trying new ideas and dishes. Situated perfectly to serve the student community of swansea but loved by all, Uplands have carved a name for themselves creating one of the biggest all day breakfasts you'll ever see. Having been a gamekeeper since the age of 17, and running the prestigious Six Mile Bottom Shoot for 16 years, owning and running a pub is a fairly radical change of direction for Richard Clarke. However, the corporate hospitality side of the shoot has proved very useful in his early days as Landlord, as has his experience in handling meat which now enables Richard to select only the best cuts. Enjoy browsing the film memorabilia in our sports bar and spot the stars amongst our collection of photographs or in our front bar enjoy the vast collection of wildlife taxidermy, complimented with a history of Six Mile Bottom and local game keeping. Are you up to the challenge? 72oz Rump Steak, cooked to your liking and served on a platter with onions, mushrooms, tomatoes and chips. If you can eat the entire meal within 1 hour it will be on the house however if you fail it will cost you £60 for a doggy bag. London Road, Six Mile Bottom, Newmarket, Suffolk, CB8 0UF. 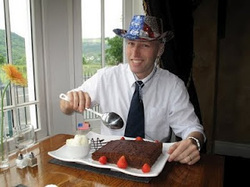 Lle Hari in Llanrwst is offering a Yankee Challenge to anyone in North Wales and beyond. Finish any starter, any main and Ffion's special 7 x 9 inch Sticky Toffee pudding and your meal is FREE. please call to reserve and accept your challenge. Yeeee Haaaaa !! 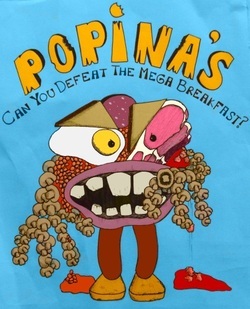 Situated in the centre of the city's student community in Hyde Park between the University of Leeds and Headingley, with excellent free parking facilities, Popina's would like to welcome you for breakfast and lunch.We guarantee you a very warm, friendly service and it isn't just taste that sets Popina's apart from the rest but we also serve what is called the Mega Breakfast !!! Their Mega Breakfast consists of 3 bacons, 3 sausages, 3 eggs,2 hash browns, mushroom, tomato, black pudding,1 fried slice, beans, bread and butter, or toast, tea or coffee (no you cant have both... stop being greddy) and all for £6.50. This one isnt really a challenge but i thought is warrented adding the Beast Pizza from Snappy Tomato Pizza's because A:- it's Massive (feeds 8-10) and B:- they have take out outlets nationwide meaning that some of the 'blackspots' on the map are filled on.. 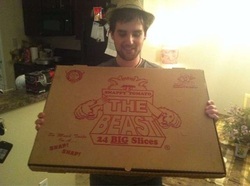 I recently tried one of their Beast Pizza's (24" by 18") at Snappy's for the first time and it was much tastier than I expected! Now I know why they call it "Snappy" Tomato! There is just something about the sauce that makes the pizza taste... well... snappy! It's a little tangy and didn't taste like anything I've ever tasted. The crust was pretty yummy too. I was pleasantly surprised and now I think I'm addicted. I crave it all the time. This was another great find, The Dog and Partridge in Tean near Stoke has created a mouth watering giant meal comprising of the 80oz steak centre piece cooked how you like it (as long as its not well done) or on a saturday night. no trophy at the end but the pride of finishing it off. yours for £39.95. An east Hull café is selling a Mega Breakfast for £9.99. 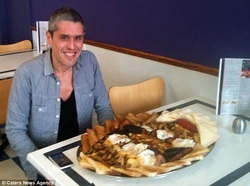 But could a Mail reporter who weighs in at 20st and stands 6ft 6in – manage the mammoth meal? Adam Lovell was up for the challenge: When I was given the task of eating a mammoth breakfast by my news editor, it seemed like I'd fallen on my feet. Eating a giant fry-up in the name of work, seemed like a prized job. He was confident of succeeding in the challenge offered up by the Rovers Return Café – polishing off a platter of food within 30 minutes. At 6ft 6in and weighing 20st, I'm known for having a hearty appetite and I wasn't remotely fazed, however; as the day dawned, I began to wonder if I might have bitten off more than I could chew. Having starved myself from 7pm the previous evening, I was certainly hungry but when I got to the Holderness Road café, and was greeted by the sight of the food, my stomach plummeted – it looked enough for 10 people. After two mouthfuls, the sheer quantity of food almost deterred me before I had really started. But, after easing myself into it, I found my stride. Sausages, eggs, mushrooms and black pudding started going down the hatch. When five minutes in, I was confident I had started making inroads into the huge breakfast.But after eating constantly for 10 minutes, the bravado waned away and the Mega Breakfast had taken control, I could feel it getting the better of me. GOURMET BURGER CHALLENGE from the Orange Rooms, Southampton has revamped its food menu and is bringing your palates a collection of the finest Gourmet Burgers on the South Coast. All our dishes are prepared freshly on a daily basis using the finest ingredients that we have begged, borrowed, stolen and where practical sourced from local suppliers. The Challenge Burger consists of an 8 oz beef, an 8oz chilli beef patty, topped with chicken strippers, mozzarella, cowboy bbq beans, onion rings, nachos, a portion of potato fries and a portion of sweet potato fries. Get yourself down to the Orange Rooms anytime between mid-day and 8pm 7 days a week for your stab at the challenge and win yourself an "I BEAT THE MEAT" T-Shirt!!! The Henry Kings Tavern are known for the traditional pub grub but if you look a little further down their the menus you will find that their hearty sizes you can have massive fish dishes, whole chicken and chips, 32 oz steaks and mixed grills but their fnest example of endulgence is the 48 steak. The Jubilee in Bourne, has now been refurbed and is now called The Jubilee Garage. It looks completely different to the old Jubilee. It has been transformed into a themed bar boasting a 1972 VW campervan in the upstairs bar. The building has vintage and retro car memorabeiler from the 1960's around the bar. 2 x classic burgers, 2 x cheese burgers, 2 x classic hot dogs, 2 x cheesy dogs, 12 x onion rings, 2 x sides of fries, 1st gear nachos, 2 x sides of house coleslaw, 2 x sides of corn on the cob, 12 x hot ‘n’ spicy chicken wings, 10 x pancakes with maple syrup and 2 x dressed house salads. Jubilee Garage, 30 North Street, Bourne, Lincolnshire, PE10 9AB. Their award-winning smoker has been imported from the USA and is built to recreate the cooking process of those original fire pits. They use the traditional American woods of hickory and mesquite to give a full smoke flavour, and the meat stays in the smoker for up to 16 hours. HOT WINGS CHALLENGE - made with fresh Naga Viper chillis.